Vintage and historical color schemes are being remixed and sampled with fascinating results. Some of this mixed color decor is intense and based on the saturated fuchsias, jades, saffrons and aquas found in Chinese Art Deco rugs made for export from the 1920s until the eve of World War II. Those are sorely out of fashion now though they can be considered bohemian. Some of it’s a hijack of the historical Rococo palette — sky blue, cotton-candy pink and celadon green — that turns it into a confetti riot. All of it’s interesting because we’re seeing staid color traditions from past centuries reinterpreted in unexpected ways. 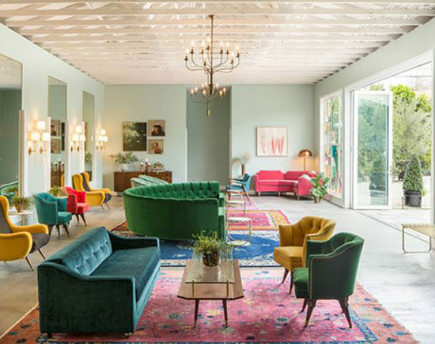 When I first saw photos of the Fig House Lounge event space in Los Angeles [top], I mistook it for a hipster living room (which, with this look it likely is). 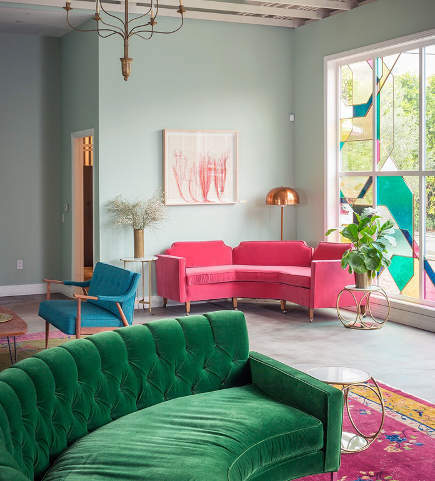 A sort of psychedelic take on mid-century modern, it’s a project launched by Emily Henderson, of hgtv fame. Before and after photos appear on Henderson’s blog along with a narrative explaining how furniture sourced from flea market and thrift stores landed on Craig’s Listed Chinese Art Deco rugs. Those, the designer says, once belonged to Bette Middler. I recall seeing those rugs long ago in an article on Midler’s house in L.A. 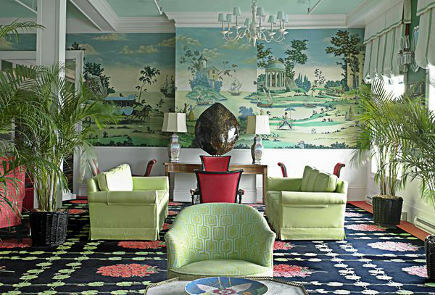 It resonated because I owned a big Deco carpet with a jade green field for many years. My purple one is currently rolled up in the basement. Our friend and Atticmag emeritus Jane Tulanian did a wonderful post on Chinese Art Deco Rugs, that explains their aesthetic very clearly. Anyone who loves big color might look out for these. Using velvet fabric as the common denominator, the mixed color decor created by Henderson required 14 different fabrics on 18 different pieces of furniture. “My upholstery dude thought I was NUTS,” she relates. The background walls are painted in the minty Theresa’s Green from Farrow & Ball. 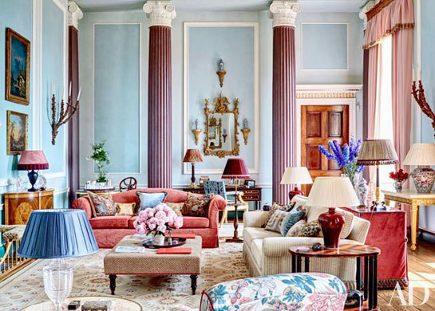 Burley on the Hill is a 300-year old Palladian mansion two hours north of London that was converted into six enormous apartments. One incorporates the Adam Room, the former dining hall which has an elaborate plasterwork ceiling in the style of Robert Adam (1728-92). The owners hired designer Mark Gilette to do the renovation. With 16-foot high columns in the room it must have been a challenge. The finished drawing room has less intense color than Henderson’s lounge but is far busier. Pastel colors are usually thought to be soothing but used all together they look like a smack down between Easter eggs and French macaroons. The ceiling here is serious business. Adam, a master of the Neo-Classical style, was known for painted ornamentation and elaborate color schemes on walls and ceilings. 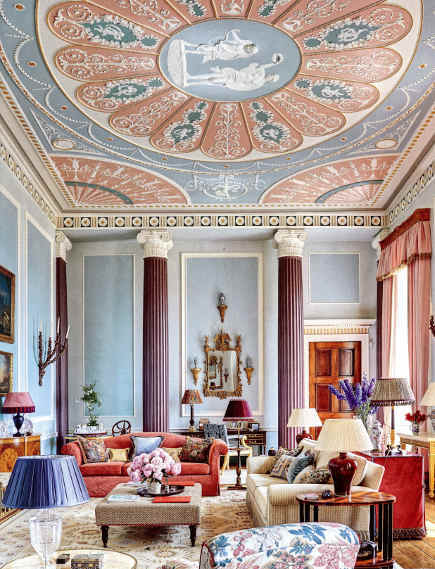 If the ceiling medallion reminds you of Grandma’s blue Wedgwood, jasperware, you’ve got a good eye. American design icon Carlton Varney is heir to the great Dorothy Draper. He decorated The Grand Hotel on Mackinac Island, Michigan,in 1976. So there’s our old friend mint green upholstery, a classic also used on hospital walls in those days. The hotel is a National Historic Landmark so it’s likely that this vintage mixed color decor specimen will be preserved for many more generations. 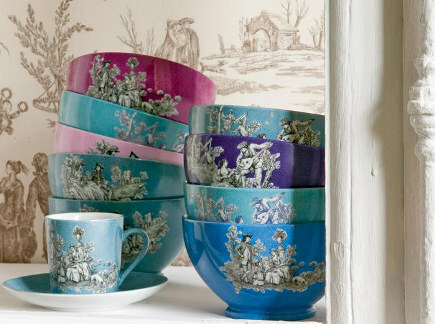 Colorful French bowls and cups with a toile de jouy motif were sold for a time on a French website but, alas, are no longer available. To me, they look like something Anthropologie would sell (and I would buy) but they may have been related to the promotion of toile, when it was revived several years ago. I adore the colors and hope they will inspire someone to do some updating again — and email so I can tell everyone where to buy them!